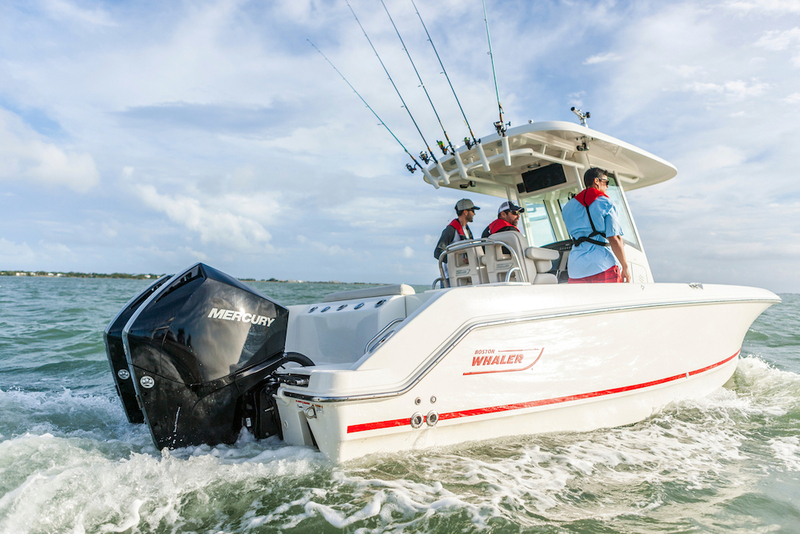 The new portable outboards feature easy-starting EFI and a new ambidextrous tiller control. 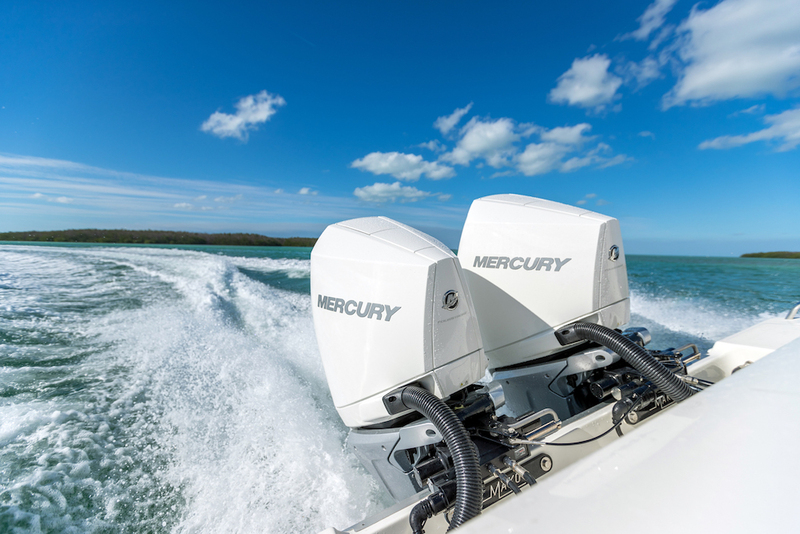 The new Mercury FourStroke 15 HP and 20 HP outboards offer an adjustable tiller handle designed to enhance comfort and control for small-boat owners. The tiller is one of those “why did it take so long” innovations that seems like an obvious idea now, but required tossing overboard decades of traditional design inertia. We’ll get to the tiller, but first the basics. These new motors, which were designed by Mercury with its long-time small-motor partner Tohatsu and will be produced by Tohatsu in Japan, also offer the benefits of electronic fuel injection (EFI) in a system that does not require a battery. Displacement of the new 333cc twin-cylinder powerhead is actually less than the 352cc motor it replaces, but Mercury says improved design actually squeezes more torque from the new powerhead. At 99 pounds, the new motor is a very significant 11 pounds lighter than the previous Merc 15/20 (the Tohatsu version weighs only 95 pounds), and is lighter than all other competitors except the 97-pound Suzuki DF20/15 which is also fuel injected. The 362cc Yamaha F20/15 has a carburetor and weighs 111 pounds, by comparison (these are all dry weights for the lightest model offered). A ProKicker 15 (left) comes equipped with power tilt, centering straps and a high-thrust four-blade prop to help it control heavy fishing boats. After loosening one bolt and a pin the tiller angle can be adjusted up to 18 degrees port or starboard in 6-degree increments. Easy manual (rope) starting is the obvious advantage of EFI. A cold motor will often start with one pull, always with two, and automatic decompression makes that pull almost a finger-tip effort. Electric start is also an option, but all motors come equipped with the rope so if the starting battery goes dead “armstrong” starting will get you moving. 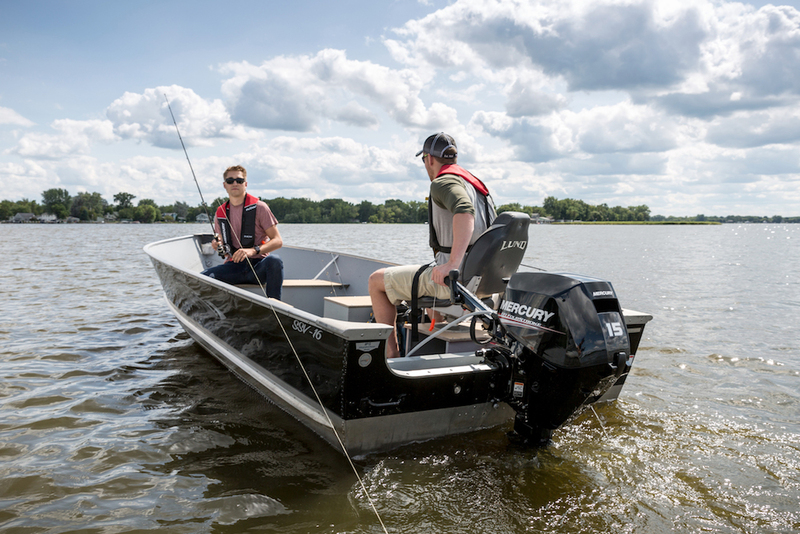 Unlike a standard carburetor, EFI automatically adjusts for changes in weather and elevation, so the motor will offer easy starts and crisp response whether you are fishing on a hot day in July or duck hunting in sub-freezing November. Mercury says fuel economy is not significantly improved by EFI. Here’s another reason to embrace EFI. Because the system is pressurized and closed to the atmosphere, EFI solves most of the problems associated with carburetors and the current fuel supply. No more gunk-filled carb after a few weeks of inactivity. 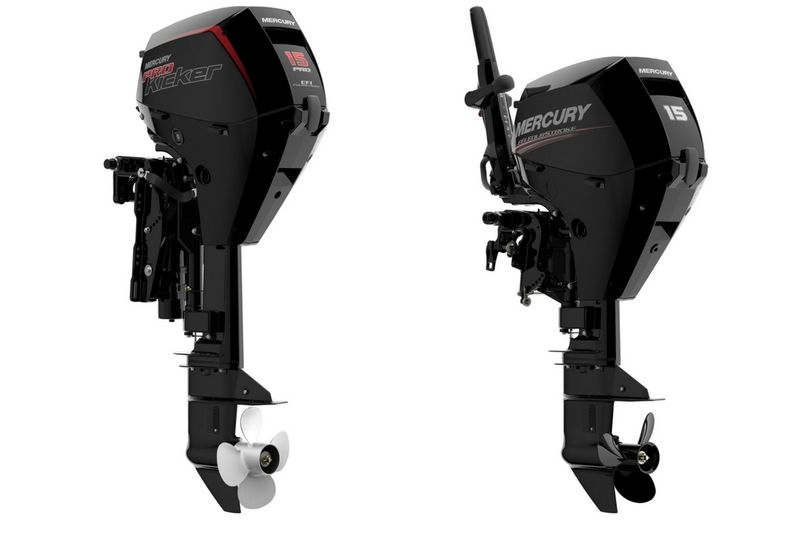 The new tiller design allows control of the new Mercury FourStroke 15/20 outboard with either the left of right hand. About that tiller. The tiller on small outboards has almost always been placed to port and designed to be controlled by the left hand. This places the operator to starboard in the boat, where his or her weight will counter propeller torque, which wants to twist the boat to port. This was more important in the past when small boats were less stable and often had round chines. 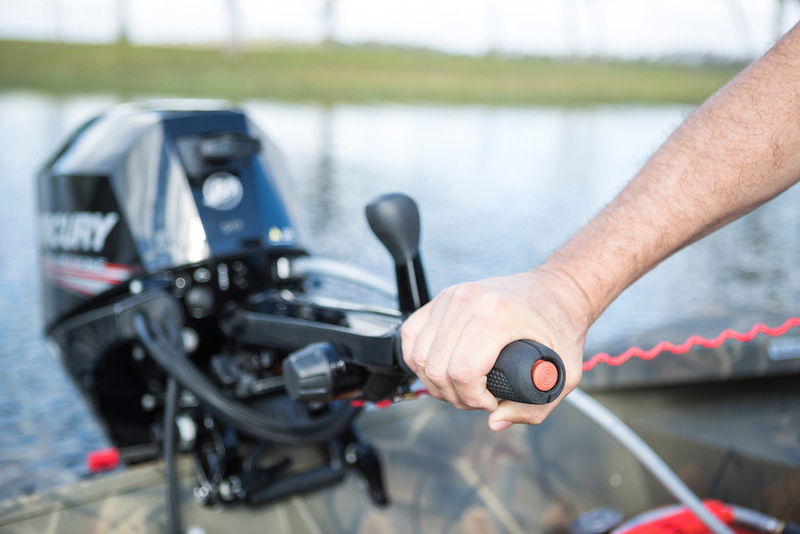 This new “ambidextrous” Mercury tiller is placed on the center of the motor and can be adjusted 18 degrees port or starboard (in 6 degree increments), so it can be operated comfortably from either side of the boat. A thumb screw under the tiller can be used to adjust its bottom stop and thus the vertical angle of the tiller to further fine-tune the fit. Merc has also made it easy to change the throttle grip for left or right rotation. Most people prefer to rotate the throttle down to accelerate, according to Mercury. Combine all of this adjustment and it should be possible to set up the tiller for ideal comfort and control in any boat, for any operator, regardless of arm length and seat position. This video offers a nice demonstration. The new Merc 20/15 is available in 15 and 20-inch lengths (plus a 25-inch 15-hp version for sail boats), with manual and electric starting, manual or power tilt, and tiller or remote control. 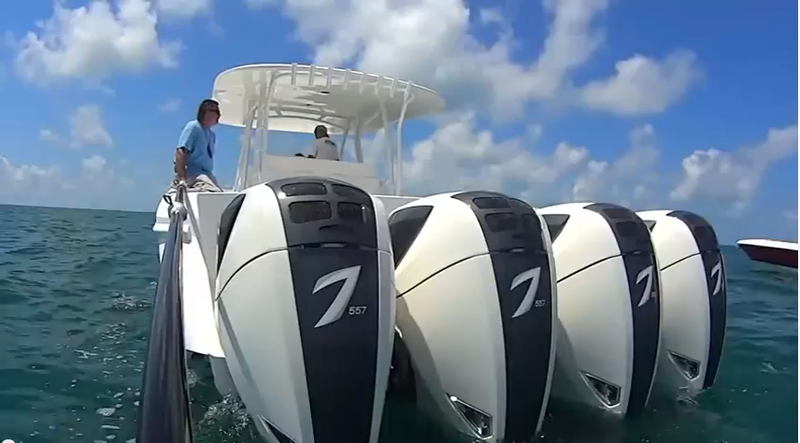 There’s also a ProKicker 15 version designed specifically for use as a trolling auxiliary with power tilt, a high-thrust four-blade propeller and exclusive centering straps that automatically straighten and lock the outboard in place when it’s tilted up to protect the clamp bracket during high-speed running and trailering. A commercial-grade SeaPro 15 designed for extra durability in a work environment is also based on this new outboard design. 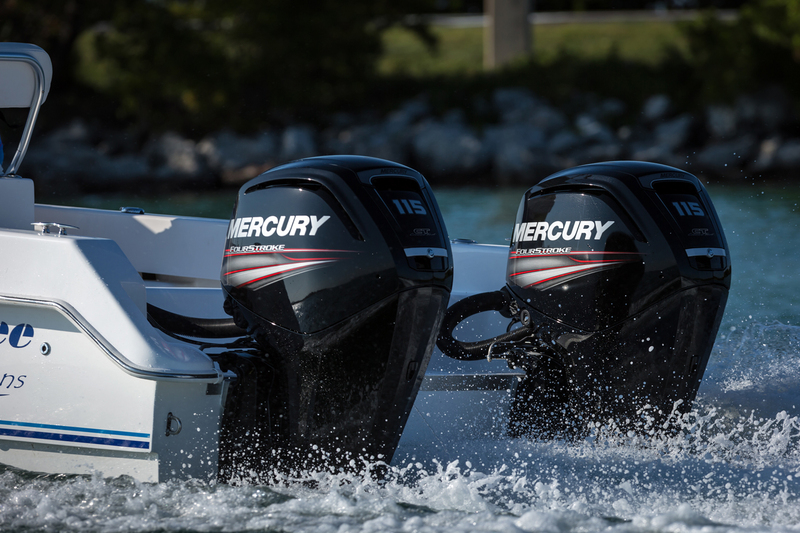 The new Mercury FourStroke 15/20 features electronic fuel injection that does not require a battery. Weight was reduced by 11 pounds compared to previous Mercury models. The new motor has been styled with a crisp new cowl that I think is a preview of the styling we’ll see on future Mercury outboards. 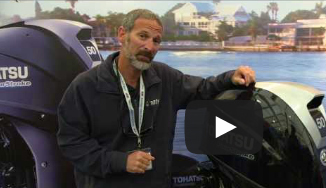 The new cowl and the design of the tiller are Mercury-exclusive features that are not offered on the Tohatsu version of the motor. 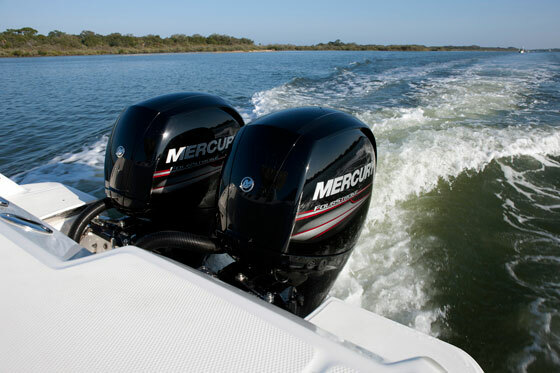 Until July the new Mercury 15/20 motors will carry the same suggested retail price as the motors they replace, starting at $2,935 for a FourStroke 15 with remote control and $2,965 the same motor with a tiller.